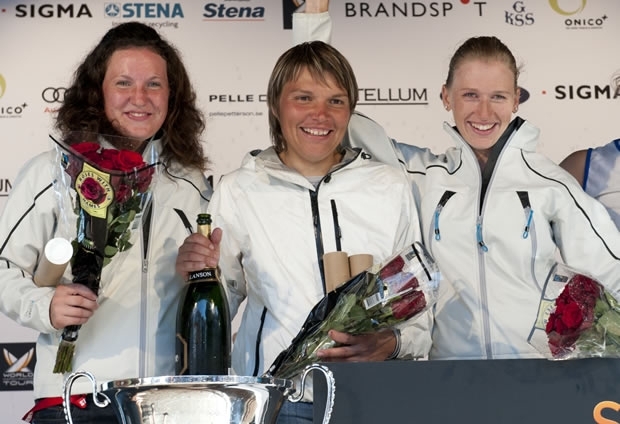 Running in conjunction with the World Match Racing Tour event this week is Women’s Stena Match Cup Sweden. Ten female crews have been racing in Elliott 6m boats that will be used in the 2012 Games. The entry of women’s match racing to the Olympic sailing competition has already dramatically increased the profile of this sport around the world and the ISAF World Match Racing Tour has welcomed paralleling the men’s racing with the women for Stage 5, halfway point of the 2010 Tour. A surprise scenario developed for the women’s semi final toady. The young 23 year old currently sitting at top of the official ISAF rankings, Lucy Macgregor (GBR), was knocked out by Renee Groenenveld (NED) who sits 12 positions below Macgregor in the rankings. The 23 year old Dutch sailor was then joined in the final by European Women’s Champion, Ekaterina Skudina (RUS), who successfully defeated 3rd ISAF ranked, Katie Pellew née Spithill, whose brother James Spithill is a well known name in the America’s Cup world. Stena Match Cup Sweden became one of the earliest match racing events to establish a women’s class back in 1999 and as a result Sweden has grown a strong national following for this ladies sport. The crowds lining the rocks watched a sunlit, emotional final where Skudina down 2 points took her situation square on and drove Groenenveld into a miscalculated premature start taking the final score to a nail biting 3-2.The Russian beauty fought off Groenenveld to be Queen of ‘2010 Women’s Stena Match Cup Sweden’. This comes as a blow to Groenenveld who also missed out closely on Olympic qualification for Beijing 2008 in the Yngling class which her adversaries then went on to win silver in. The World Match Racing Tour’s men’s racing is also heating up today after Jesper Radich (DEN) took top pickings going into tomorrow’s semi-finals tomorrow. In preparation for the last day of Stena Match Cup Sweden Radich’s crew, Rasmus Köstner, was on site for the pick. Radich now faces Sweden’s favourite, Magnus Holmberg. “We decided to make it as hard as we could for ourselves and pick Magnus, we are going to be the under dogs but we hope to get something out of it”. Meanwhile TeamOrigin's Ben Ainslie will meet Australian Torvar Mirsky, who has also built up a strong Swedish fan base here. Mirsky sees Ainslie as ‘God of sailing who summons his own wind to his boat’. An upbeat Mirsky went on to say that his team are going to, “Push him and hopefully break him tomorrow”. The remaining 4 racers are all pinning their hopes on being ‘Maestro of Marstrand’ to be decided tomorrow during the final ‘boat on boat’ racing to Stage 5 of the 2010 ISAF World Match Racing Tour.